Merriam-Webster revealed on Tuesday that its word of the year for 2017 is "feminism," a buzzword that has factored into prominent political and cultural debates over the course of the year. Searches for "feminism" on the Merriam-Webster website increased by 70 percent from 2016 and spiked several times after key events, according to Peter Sokolowski, the company's editor at large. 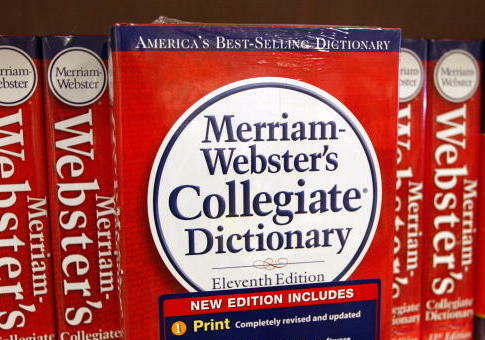 The Associated Press first reported Merriam-Webster's choice for word of the year before the company made the official announcement. The Women's March on Washington, which followed President Donald Trump's inauguration in January, Hillary Clinton's run for president, and the #MeToo movement in support of sexual harassment victims have all sparked more conversation involving feminism this year. Feminism has been on Merriam-Webster's annual Top 10 the past few years; it was beat out by "surreal" last year. "The word feminism was being used in a kind of general way," Sokolowski told the AP. "The feminism of this big protest, but it was also used in a kind of specific way: What does it mean to be a feminist in 2017? Those kinds of questions are the kind of things, I think, that send people to the dictionary." In 2017, Merriam-Webster defined feminism as the "theory of the political, economic and social equality of the sexes" and "organized activities on behalf of women's rights and interests." A large spike in searches for feminism occurred after White House counselor Kellyanne Conway spoke at the Conservative Political Action Committee in February about her stance on feminism. "It's difficult for me to call myself a feminist in the classical sense because it seems to be very anti-male and it certainly seems to be very pro-abortion," Conway said. "I'm neither anti-male or pro-abortion. There's an individual feminism, if you will, that you make your own choice … I look at myself as a product of my choices, not a victim of my circumstances. And to me, that's what conservative feminism is all about." Other events that coincided with a spike in searches for feminism included the release of "The Handmaid's Tale" and Wonder Women. Merriam-Webster's nine runner-up words for 2017, in no particular order, were "complicit," "recuse," "empathy," "dotard," "syzygy," "gyro," "federalism," "hurricane," and "gaffe." This entry was posted in Culture and tagged War on Women, Women. Bookmark the permalink.